Welcome to 4for4 Fantasy Football, home of the most accurate fantasy football rankings since 2012. 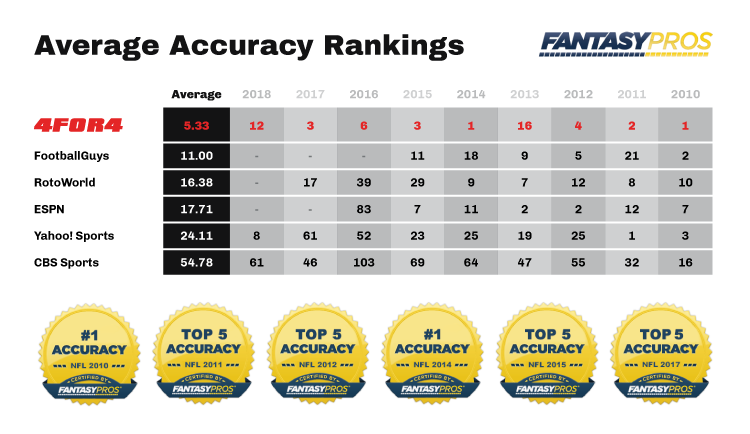 If you want to win your league this year, you need verified-accurate in-season rankings, decision support tools, weekly reports and a little bit of luck. 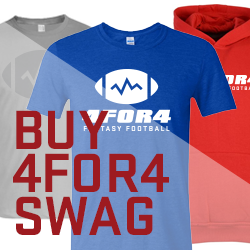 Find out how subscribing to 4for4 Fantasy Football can help you make the playoffs and WIN! What's the #1 Thing 4for4 Offers? Senior Editor, John Paulsen, was named the Most Accurate Fantasy Football Expert by FantasyPros in both 2010 and 2014 and was the runner-up in 2011. In 2012, 2015, and 2017 he finished top 4. According to FantasyPros, no one has been more consistently accurate than Paulsen, who has finished top six in 7 of the past 9 seasons. Paulsen’s draft rankings are accurate as well. From 2015 to 2017, he finished 8th out of 77 experts/sites that were tracked via FantasyPros. Under a different FantasyPros methodology from 2011 to 2014, Paulsen’s draft rankings finished 4th out of 32 experts/sites that were tracked during that span. You can certainly have a strong draft with your fantasy football acumen and a good old-fashioned paper and pencil. However, with our FREE draft software, you’ll be unstoppable. Our FREE draft software makes thousands of calculations and sees patterns not humanly possible to find in the sixty seconds you have to make your pick. Your savvy fantasy football mind + our FREE draft software = an unbeatable draft. It’s as if you have a large department of statisticians crunching numbers and offering you an objective suggestion of who to draft. PLUS, it can pull all your league information and LIVE sync with your ESPN, Yahoo!, MyFantasyLeague, and RT Sports draft! Available for desktop and mobile devices. To create an up-to-date list of 400+ players, customized to your league’s rosters requirements and scoring settings, you need our LeagueSync set of tools. With LeagueSync, you don't have to worry about downloading files and messy installations. Just enter your league information once and you are all set. Our tools are fully integrated and can sync all of your leagues with the touch of a button. LeagueSync is all about providing customized analysis for your roster and your league, providing interactive analysis and decision support tools tailored to you. No more canned reports or "one size fits all" analysis. Even the savviest fantasy football owner will reap significant benefit and time savings using LeagueSync. → Custom Scoring Cheat Sheets - takes your cheat sheets to the next level by allowing you to combine our projections with your scoring rules. It’s all about custom decision support for your needs. → Custom Value Based Top-200 Rankings - allows you to combine your scoring rules with our Value Based Rankings to create a fully customized Top-200 list. → Custom Scoring Auction League Cheat Sheets - combines your scoring rules with our projections and to give you a fully customizable Auction Cheat Sheet. → Top-200 Keeper Rankings - combines your scoring rules with our Keeper Rankings and allows you to specify how important winning now is, versus looking towards the future. → Team Evaluator - fill in your starting lineup and another team’s lineup in your league. The Team Evaluator will show you projected points by player and team for your scoring system. → Trade Evaluator - fill in your starting lineup before and after a proposed trade to see if you get stronger or weaker. The Trade Evaluator does all the number crunching for you and the results fit your scoring system and your situation. → Draft Simulator - provides a custom mock draft simulation. You’ll see how you did and you’ll see how the computer teams made out as well. In addition, the Draft Simulator will analyze your roster in terms of Injury Risk, Playmaking Ability and more. Practice makes perfect. → Weekly Assistant Coach (WAC) - provides custom sit/start advice for your scoring system, along with some ideas and hints on how you can increase your odds of victory that week. → ADP Draft Planner - scours actual draft data from various sources to provide real-world availability for players at virtually any point in the draft. → Top-200 Tool - customize our Top-200 Value Based Rankings (VBR) for your starting lineup and core team needs. → Keeper Rankings Tool - customize our generalized Keeper Rankings for your starting lineup and core team needs. → Draft Day Bargains Tool: 4for4 vs. ADP - highlights the top draft day bargains for your starting lineup and core team needs. → Draft Day Do’s & Don’ts Tool - integrates projected stats, ADP values and competitive analysis into a unique and powerful cheat sheet companion. Delivered in an easy to read round-by-round format, this tool displays bargains and keeps you from overspending. → Auction Values Tool - customize our Auction Values for your starting lineup and core team needs. → Daily Fantasy Value Reports - designed to help you quickly identify good player values to maximize winning and profitability in Daily Fantasy Football (weekly contests run at sites like FanDuel, DraftKings, Yahoo!). → Player Snap App - browse player participation (snap) data from each week of the NFL season. → Whose Schedule Gets Easier? Harder? → Who’s Exceeding Expectations? Who’s Not? To access our Value Reports and Lineup Generator, which uses our most accurate projections to build up to 500 daily fantasy football lineups (FanDuel, DraftKings, Yahoo! ), you will require our DFS Subscription. The DFS subscription also comes with floor and ceiling projections, top picks and lineups from DFS Expert, Chris Raybon, stack value reports and more. To be the best, it's important your information and insights come from true football professionals, people that really know the game and people that make their living attending NFL practices and interviewing players. Our insiders have access, really know football and actively participate in fantasy leagues. This combination allows us to deliver unmatched insights, giving you a huge edge in your league. As all experienced fantasy football owners know, injuries are a huge part of the game. Our staff keeps a close eye on injuries throughout the week, updating subscribers on practice participation and IR status. Our visual, color-coded reports provide an instant overview of the significant injuries by team and by position so that fantasy owners can get the information they need quickly and efficiently. We also publish a weekly Upgrade/Downgrade Report which has proven to be a good indicator of player availability.